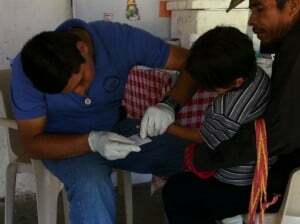 Shoulder to Shoulder provides quality health care throughout the region of southern Intibuca. Our two main clinics in Concepcion and Santa Lucia form the hub for our medical services. Here, patients receive free emergency, primary, and post/neo natal care. Our diagnostic and laboratory services offer ultrasound examinations, radiology, and complete laboratory tests. They are also the centers for several of our dental, community health, education, and nutrition programs. In these facilitaties we provide housing for many of the doctors, nurses, and medical support staff that we employ, and in our dorms we can house visitors and large groups for short stays. We also administer seventeen outer clinics, serving the underdeveloped area of southern Intibuca known as the Dry Corridor. These clinics cover the seven municipalities of Camasca, Colomoncagua, Concepción, Magdalena, San Antonio, San Marcos de la Sierra, and Santa Lucia. Our contract with the Honduran Ministry of Health designates Shoulder to Shoulder/Hombro a Hombro as the sole medical provider for this large swath of territory. A population of 69,000 persons depend on Shoulder to Shoulder for their health and well-being. Prior to the construction of Shoulder to Shoulder/Hombro a Hombro’s first clinic in 1994, the nearest health care facility was a five-hour bus ride over a dangerous and sometimes impassable mountain road. Today, residents of southern Intibucá can reach one of the nineteen facilities and three affiliate clinics within a one-hour walk of their home. For maps of our locations, see where we serve. We firmly believe that keeping people healthy, protecting them from disease and malnutrition, is a just response to human dignity. Our philosophy of partnering with the local population empowers individuals, groups, and communities in sustainable development. Your donation facilitates us in providing quality medical care, education, and nutrition and improving individuals’ lives.